The Sarah Curtis Home in Tokyo, Japan. 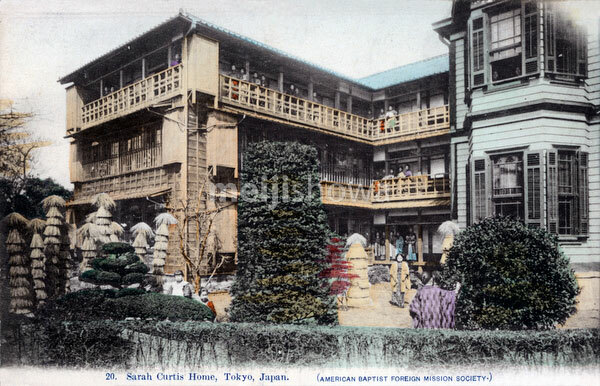 The Sarah Curtis Home was a school for high school age girls established by the American Baptist Foreign Mission Society (aka American Baptist Missionary Union) in 1875 (Meiji 8) as Shuntai Eiwa Jogakko (駿台英和女学校) on ground leased from Japanese statesman Arinori Mori (森有礼, 1847–1889). American missionary Anna H. Kidder (アンナ・H・キダー, 1840-1913) played an important role in the school. According to a report in 1917 (Taisho 6), some 61 pupils were enrolled at the time. Some of the girls who graduated became teachers, a few of them returning to the Sarah Curtis school to teach there. According to contemporary newspaper reports, the school was completely destroyed in the Great Kanto Earthquake of 1923 (Taisho 12).